My ALL TIME favorite spacecraft, the Lunar Reconnaissance Orbiter (LRO), is still going strong in lunar orbit. 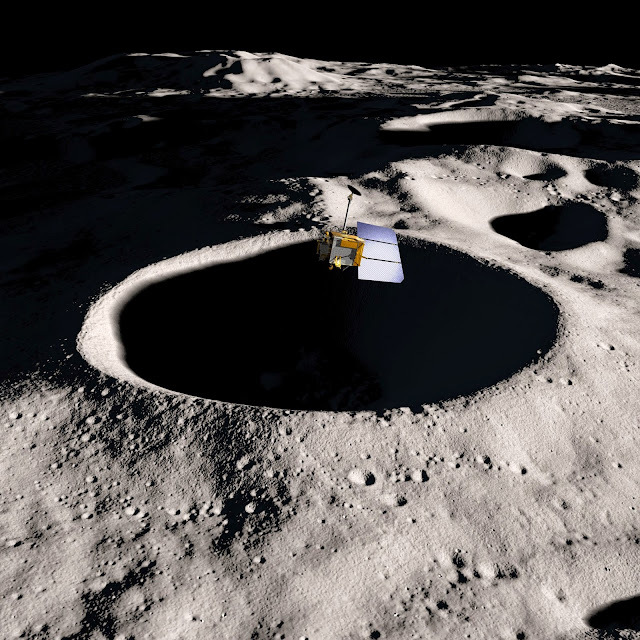 The mission controllers at NASA Goddard Spaceflight Center (GSFC) have made LRO a lunar LOW rider spacecraft as they took LRO's orbit down to a mere 12 miles above the Moon's South Pole! That is the lowest LRO has ever been. The lower altitude will allow the instruments and cameras aboard LRO to gather data and pictures significantly better than in the past. The South Pole is an intriguing place to explore on the Moon because we know there is water in craters that never receive sunlight. We can expect some exciting news from LRO in the coming months as the data and pictures start to come in. LRO can last for years to come but is facing budget cuts that threaten to curtail a perfectly working spacecraft in lunar orbit. This would be a MONUMENTAL WASTE to do so. Write your congressman to SAVE LRO.